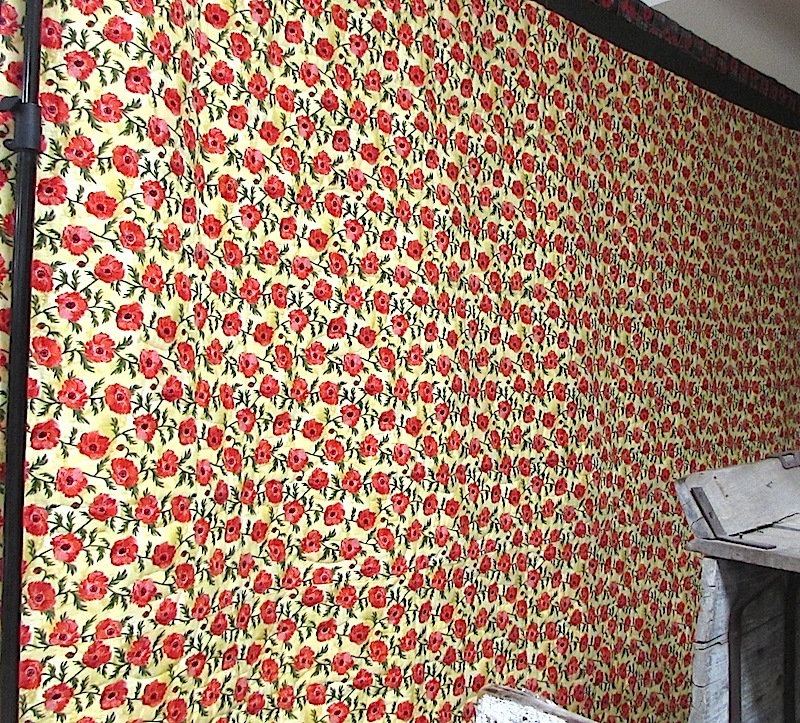 Wendy Lauen of McHenry is this year's winner of Heritage Quilters' "Forever Poppies" quilt. 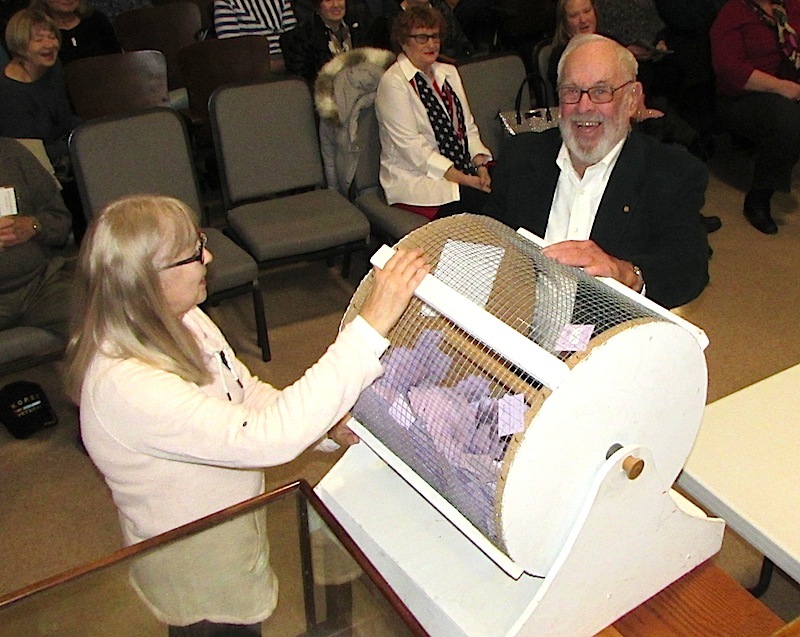 Bo McConnell selected the winning ticket during the Nov. 7 afternoon quilt program. Lauen is not a quilter like her mother-in-law, nor has she purchased a quilt raffle ticket in the past. If you know her, consider stopping by. Perhaps some of that luck will rub off!! The 2018 Heritage Quilters Raffle Quilt features a World War I theme. Veteran quilter, Arlen Bird, noted the "rolling stone" pattern originated in 1780's New England. It features a nine-patch with cream, several greens, and a showy black and red poppy fabric at the center. The block has been around for many years – published in the Chicago Tribune Nancy Cabot column. In March 1933 the paper stated that the rolling stone pattern originated in New England around 1780. And Barbara Brackman states in her book that the block dates back to the Ladies Art Company catalog in print in 1895, and noted it was probably much older. There are many variations of this block – with diamonds on the side pieces, more triangles in the center, added squares in the corners, one having as many as 65 pieces per block. Our block, looking much more simple, has 29 pieces. Ethel Byron JANSEN was born in 1893, died in 1932. She enlisted in the Army Nurse Corps in January 1918. Deployed later in that year, she was discharged in April 1819, whereupon she married Harold S. McCONNELL. Harold had enlisted in the USNG [National Guard] as a private in Headquarters Troop, 33rd Division. He departed for France in May 1918 aboard the USS Mt Vernon. That ship later was torpedoed with loss of life, but it did make it back to port for repairs. Harold served in the trenches of France and was subjected to gas attacks. He recovered, but later fell ill during the Spanish flu pandemic which swept across the U.S. and the world. It was later calculated that this deadly flu killed 5 percent of the world's population. Harold survived and later married Ethel married in April 1920. It is not known how or where they met. The couple had two sons, one of whom died as an infant. They lived in Woodstock along with their son, William H., and with Harold' s parents – William and Susan McConnell, according to the 1930 federal census. Ethel died of pulmonary tuberculosis in May 1932, in Winfield, Ill. which was the location of a TB sanitarium. She is buried in Oakland Cemetery, Woodstock. Harold went on to remarry and eventually moved to Pueblo, Col. to ease his residual lung problems suffered during the Great War. He died in 1975 and is buried in Pueblo. Both of these veterans served with honor and survived the war. But each was forced to cope with health issues resulting from their service, to the end of their days. It is fitting that our quilt, "Forever Poppies," be dedicated to these two brave souls from McHenry County. Even before the onset of the “Great War,” many women in the United States were campaigning for equal rights – including the right to vote. Sadly, few of these female patriots are part of the county's collective historical memory. A rare exception was Choloretta Thompson, a member of the U.S. Army Nursing Corps. Thompson, a daughter of Frank and Mayetta Thompson, was born in Harvard in July 1896. Trained at Fort Dix, N.J., she arrived in France at the end of September 1918. She was a ward nurse at an American base hospital until she was sent home sick with tuberculosis contracted there. She died in Harvard on Oct. 11, 1920, and is buried in Harvard’s Mt. Auburn Cemetery. Members of the Red Cross Auxiliary in McHenry County participated by working in groups to prepare “comfort kits” to be sent to McHenry County soldiers in Europe. These kits most often contained, socks, shoelaces, linen towels, bars of soap, toothbrushes and toothpaste, needles and thread, and a New Testament Bible. Such kits were well received by the soldiers and were remembered for years after the war. Other McHenry County women who directly participated in the war were members of the Salvation Army, who spent their time in Europe preparing special meals and handing out doughnuts in rear areas away from the fighting. All of it was important work and nearly all of it has been forgotten. It is our hope that this quilt will serve as a lasting reminder about the roles women played "in the trenches" – be it at home or near the battlefield. As for the poppy story – it has long been a symbol of sleep, peace, or even death. Surprisingly, it is mentioned as a threat in the "Wizard of Oz." While beautiful, the field of poppies made Dorothy sleepy, and the scent would eventually cause her death. Fortunately, her companions found a way to carry her to safety and the fresh air revived her. Other sources note the bright scarlet color promises resurrection. 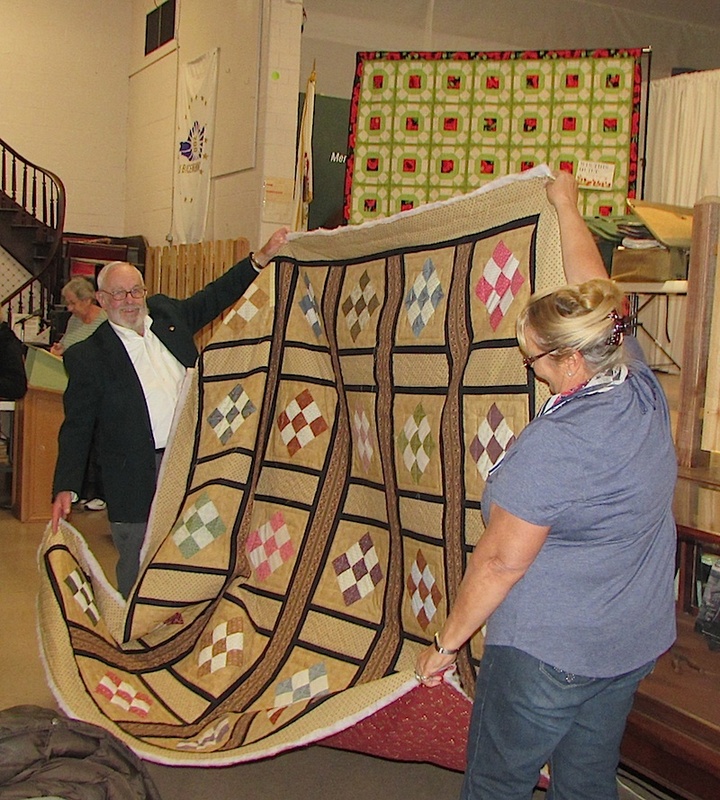 Join the Heritage Quilters Wednesday mornings throughout the year at the museum, 6422 Main St. in Union. Quilters of all levels are welcome. For information, call 815-923-2267.